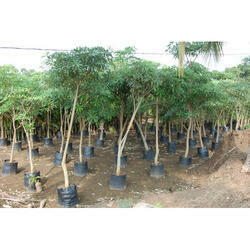 Our product range includes a wide range of alstonia scholaris plant, tabebuia rosea plant, cordia sebestena plant, ficus religiosa plant, pongamia pinnata plant and spathodea campanulata plant. 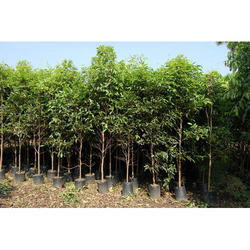 We are an esteemed wholesaler, supplier, and exporter of an exceptional quality assortment of Alstonia Scholaris Plant. The upper side of the leaves is glossy, while the underside is greyish. Leaves occur in whorls of three to ten. Lateral veins occur in 25 to 50 pairs, at 80-90° to midvein. Cymes are dense and pubescent. Pedicels are usually as long as or shorter than calyx. The ovaries are distinct and pubescent. The follicles are distinct and linear. The crown is wide, stratified, and irregular, with a few thick, horizontal branches; the bole is straight, sometimes channeled at the base. Leaves are palmately divided into 5 unequal leaflets. The oval/oblong leaflets have a rough-to-touch surface, entire margin, and a pointed tapering tip. The central leaflet is larger than the rest. Flowering occurs between December and February when the tree bursts into panicles of pink trumpet-shaped flowers with yellow throats. 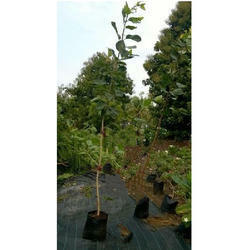 Cordia Sebestena Plant is one of the most popular of the West Indian trees. Appearing throughout the year, but especially in spring and summer, are dark orange, 2 inches across flowers which appear in clusters at branch tips. Flowers are orange, with a narrowly crinkly tube, flaring open into a flat-faced flower. Sepal tube is long and narrow, longitudinally channeled. The large, ovate, stiff, dark green leaves are rough and hairy, feeling much like sandpaper. Flowers are pear-shaped fruits, which have a pleasant fragrance but are not particularly tasty. Scarlet Cordia is native to the northern coast of South America. Ficus religiosa is scientific name of Pimpal.The leaves of this tree move continuously even when the air around is still and no perceptible wind is blowing. This phenomenon can be explained due to the long leaf stalk and the broad leaf structure. However, religious minded people in Hindu/Buddhist religion attribute this movement of the leaves to the fact that "devas" or "gods" reside on these leaves and make it move continuously. This fact is also mentioned in the Bhagavad Gita as a verse "O Ashvatha. The Ficus religiosa tree is considered sacred by the followers of Hinduism, Jainism, and Buddhism. In the Bhagavad Gita, Krishna says, "I am the Peepal tree among the trees, Narada among the sages, Chitraaratha among the Gandharvas, And sage Kapila among the Siddhas. BuddhismThe Bodhi Tree at the Mahabodhi Temple. Propagated from the Sri Maha Bodhi, which in turn is propagated from the original Bodhi Tree at this location.Gautama Buddha attained enlightenment (bodhi) while meditating underneath a Ficus religiosa. The site is in present-day Bodh Gaya in Bihar, India. The original tree was destroyed and has been replaced several times. A branch of the original tree was rooted in Anuradhapura, Sri Lanka in 288 BCE and is known as Jaya Sri Maha Bodhi; it is the oldest flowering plant (angiosperm) in the world. In Theravada Buddhist Southeast Asia, the tree's massive trunk is often the site of Buddhist or animist shrines. 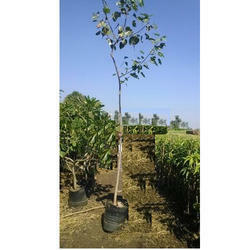 Not all Ficus religiosa can be called a Bodhi Tree. A Bodhi Tree must be able to trace its parent to another Bodhi Tree and the line goes on until the first Bodhi Tree under which Gautama is said to have gained enlightenment. Hinduism A Sacred Peepal Tree at a Hindu temple in Chandigarh, India. Sadhus (Hindu ascetics) still meditate beneath sacred fig trees, and Hindus do pradakshina (circumambulation, or meditative pacing) around the sacred fig tree as a mark of worship. Usually, seven pradakshinas are done around the tree in the morning time chanting "vriksha rajaya Namah", meaning "salutation to the king of trees." It claimed that the 27 stars (constellations) constituting 12 houses (rasis) and 9 planets are specifically represented precisely by 27 trees—one for each star. The Bodhi Tree is said to represent Pushya (Western star name γ, δ and θ Cancri in the Cancer constellation). Plaksa is a possible Sanskrit term for Ficus religiosa. However, according to Macdonell and Keith (1912), it denotes the wavy-leaved fig tree (Ficus infectoria) instead. In Hindu texts, the Plaksa tree is associated with the source of the Sarasvati River. Skanda Purana states that the Sarasvati originates from the water pot of Brahma flows from Plaksa on the Himalayas. According to Vamana Purana 32.1-4, the Sarasvati was rising from the Plaksa tree (Pipal tree).Plaksa Pra-Sravana denotes the place where the Sarasvati appears. In the Rigveda Sutras, Plaksa Pra-Sravana refers to the source of the Sarasvati. 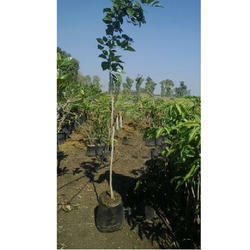 Pongamia Pinnata Plant is normally planted along the highways, roads, and canals to stop soil erosion. Billions of trees exist all over India. If the seeds fallen along the roadside are collected, and oil is extracted at village level expellers, thousands of tons of oil will be available for Lighting the Lamps in the rural area. It is the best oil for lighting. Since these are spread over a large area, the collection of seeds for BioDiesel manufacture is not viable. 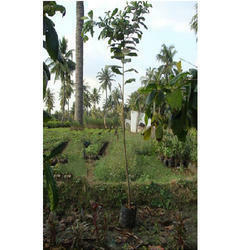 (A compact plantation can support a BioDiesel plant). Pongamia Pinnata is called as Koroch in Bangladesh. There, it is a freshwater flooded plant/tree. The seedlings of Koroch can survive in 1.5 meters deep water submergence/inundation for five to six months duration at a stretch. There is nearly 30,000 square km of water reservoirs in India. This tree can be cultivated in such water storage reservoirs up to 1.5 meters depth and reap additional economic value from unused reservoir lands. Pongamia Pinnata is one of the few nitrogen fixing trees to produce seeds containing 30 to 32% oil. It is often planted as an ornamental and shade tree. This species is commonly called Pongam, Karanj, or a derivation of these names. Pongamia (Leguminoceae, subfamily Papilionoideae) is a medium-sized tree. The trunk is generally short with thick branches spreading into a dense hemispherical crown of dark green leaves. The bark is thin gray to grayish-brown, and yellow on the inside. The taproot is thick and long, lateral roots are numerous and well developed. 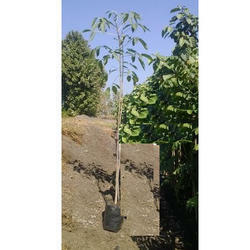 We are providing Spathodea Campanulata Plant is a large tree that can reach 50 ft in height. The pinnate leaves grow to 40 cm (16 in) long and they are bronze in color when young, turning deep glossy-green at maturity.This is one of the nicest blooming trees in the world. Large clusters of velvety, bronze-green, kidney-shaped buds are produced at the ends of the branches. The flowers are large, brilliant red-orange (yellow in some cultivars) in color and with crinkled margins. The tree blooms throughout the year but only a few flowers open at a time. The unopened flowers contain water inside, which the birds are drinking. The tree blooms throughout the year but only a few flowers open at a time. The unopened flowers contain water inside, which the birds are drinking. The fruit is a long pod, that breaks open when they fall from the tree. Inside there are very small seeds with transparent wings. The herb Ficus Benghalensis Plant belongs to the plant family Moraceae, the order Rosales, the Genus Ficus (as is indicated by the name) and the subgenus Urostigma. It is commonly known as the Banyan Tree in India. In earlier times, traders and businessmen used to frequent the shade of this tree while traveling. These traders were referred to as ‘Baniyas’ and that is how the tree got its Indian name. It has been found throughout India since times immemorial but for long people did not know about its therapeutic values. Its name comes up in the majority of the songs and poems of olden times. It can also be found along roads and pathways across the country. The tree is native to India and grows all over the country. The Banyan Tree is famous all over India as the tree with aerial roots. It has a distinct trait where all its branches, after growing to a certain length, drop down to the ground, take roots again and then branch out again in different directions. This subsequently increases the growth of the tree indefinitely. Its leaves are shiny, smooth and oval in shape and quite leathery to touch. The fruits, as well as, the flowers of the plant are very small in size and mostly grow in clusters. Ficus benghalensis has found many uses as a medicinal herb. It can be used internally or as a preparation that can be applied externally. Ficus trees are a common plant in the home and office, mainly due to the fact that they look like a typical tree with a single trunk and a spreading canopy. But for all of their popularity, ficus plants are finicky. However, if you know how to care for a ficus tree, you’ll be better equipped with keeping it healthy and happy in your home for years. 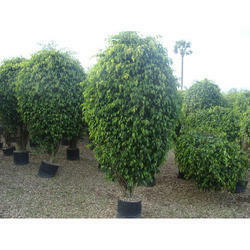 Learn About Ficus Houseplants What is commonly referred to as a ficus is technically a weeping fig. It’s a member of the Ficus genus of plants, which also includes rubber trees and fig fruit trees. But when it comes to houseplants, most people refer to a weeping fig (Ficus benjamina) as simply a ficus. Ficus trees can maintain their tree-like shape regardless of their size, so this makes them ideal for bonsais or for massive houseplants in large spaces. Their leaves can be either dark green or variegated. In recent years, some imaginative nurseries have started to take advantage of their pliable trunks to braid or twist the plants into different forms. Uses as food: The nuts are edible, taste like almonds and are eaten, although the flesh is troublesome to separate from the hard stone (Malays and some Pacific Islanders). Unlike the commercial almond, the Sea Almond can be eaten raw. Oil extracted from the dried nuts is edible and used in cooking (South America). Other uses: Its timber is not widely used, but in some places where another suitable timber is lacking (e.g., islands), it is made into heavy-duty items like carts, wheels, and posts. Tannin and a black dye can be extracted from the bark, leaves, and fruit. In Singapore, it is a common wayside tree, planted to provide color and shade. Leaves, bark, and fruits: dysentery (Southeast Asia); dressing of rheumatic joints (Indonesia, India). Fruits and bark: coughs (Samoa), asthma (Mexico). Leaves: get rid of intestinal parasites (Philippines); treat eye problems, rheumatism, wounds (Samoa); stop bleeding during teeth extraction (Mexico), fallen leaves used to treat liver diseases (Taiwan), young leaves for colic (South America). Bark: throat and mouth problems, stomach upsets and diarrhea (Samoa); fever, dysentery (Brazil). Modern research has identified some properties which could be used to treat high blood pressure. Role in the habitat: Various species of biting and stinging ants have been found inhabiting hollow twigs of the tree. While the tree provides these creatures with a home, the ants, in turn, may protect the tree from insect predators. Fruit bats eat the husk of the fruit. 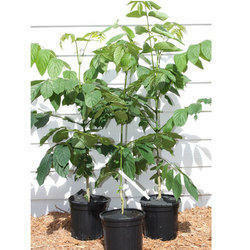 Looking for Avenue Plants ?